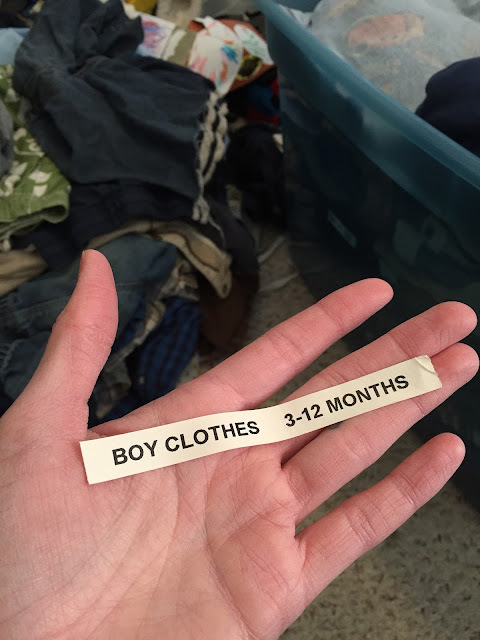 I had most of the bin filled with off-season clothes already when I noticed the old label on the side. How many years have passed since I printed that neat, white label on my handy organizing must-have, only to have misplaced it all these years later somewhere in the abyss of unpacked boxes in the basement. How many other bins of clothes have since been sloppily thrown together and tossed to the side to be rummaged through again the next season in equal haste. Once upon a time, much like a nice little fairy tale, I used to be organized. A place for everything and everything had a place, with labels to boot. I cleaned my house weekly and completed tedious "extra" tasks, such as vacuuming couches and stairs, regularly. There were meal plans and menu boards, and upon reading the yummy list of options for the week, friends would say, "I'm eating at your house!" 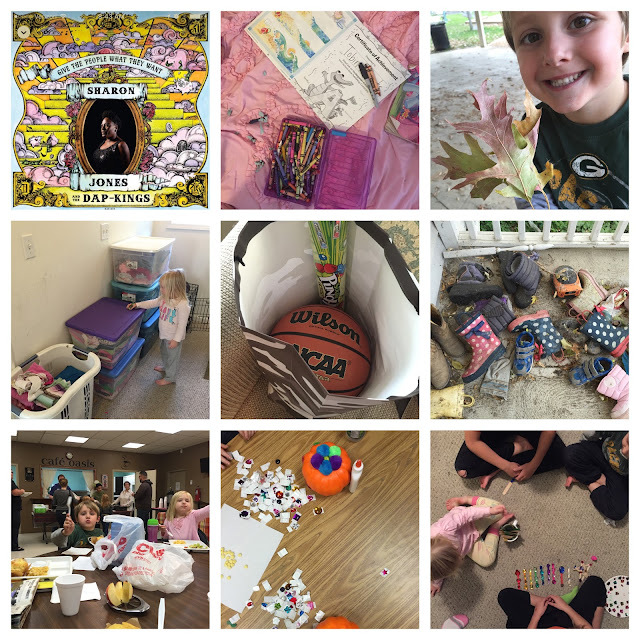 About three children into this whole motherhood thing, the scales tipped against the camaraderie I had with the noble pursuit of organization. Really, it was probably after the second kid, when I stood home alone for long and weary days, desperately outnumbered and reduced to a pile of tears or sheer numbness by tiny humans barely three feet tall. It wasn't that I no longer wanted to be organized, that I didn't want my days to run smoothly. I was one person now stretched three ways thin. Then four ways thin, and now soon to be five. It was the simple realization that a mother of four, or certainly five, cannot perform in the same capacity as a mother of one. The freeing conclusion that, for a mother of four, priorities were simply not the same as they were with one. As the seasons of our lives shift seamlessly as summer does to fall, as the families under our roof grow and change, we need to learn anew how to live within our means. As humans, as women, as mothers. Not our financial means, although that certainly does play a role, but I'm speaking more of our physical, emotional and mental means. Because those change with time, and it's okay. For many years I strove to achieve this ideal image of a stay-at-home wife and mother. For myself, mostly. I thought my house should look a certain way, that my children should behave a certain way at all times. The pressure I put on myself was intense, and I would feel incredibly guilty if I yelled at my children or didn't manage to keep up with every task at home like I thought I should. And while there may be some type A+ people who can keep up with mopping floors and washing bedding and dusting crevices and whatever else on a weekly basis, I finally had to face the reality that it's just not me. For me, sustaining those demands is not living within my means. Because I became a very angry, resentful person when I tried to do so. I sacrificed quality time with my kids for clean floors, traded good communication with my husband for a thorough deep-cleaning, and exchanged the calmness of letting go for the stress of keeping up. If you want to know the truth, I'm actually on the I-can't-remember-the-last-time-I-mopped-my-floors cleaning schedule now. Contrary to popular germaphobe propaganda, you will not, in fact, keel over and die from dirty floors. Or bedsheets. Or bathrooms. Just in case you were wondering. Life that is truly life isn't found in striving towards an imaginary ideal or comparing your life to someone else. It exists in the freedom of being enough exactly as you are. Doing what you need to do for yourself and your family in order for you to survive, and on a good day, even thrive. And that will look different for everyone, because Lord knows we all function at a different capacity. As needs change, so do priorities. A friend of mine mentioned over the summer that she had been up until 1:00am scrubbing her toddler's muddy shoes clean. I laughed to myself as I thought about the pile of muddy shoes that have been sitting by our side door for months. In fact, they're still there today. Ain't nobody got time for that. Seeing as how a colony of spiders has apparently moved in, the only place they're going now is the garbage can. Priorities. That's good enough for me.